2. Using a 10mm socket, remove mounting bolts from the front side of throttle body. Remove throttle cables and wire connectors. Now remove throttle body. Leave original gasket on intake if mileage is under 70,000. 3. Remove the three throttle body studs from intake. 5. 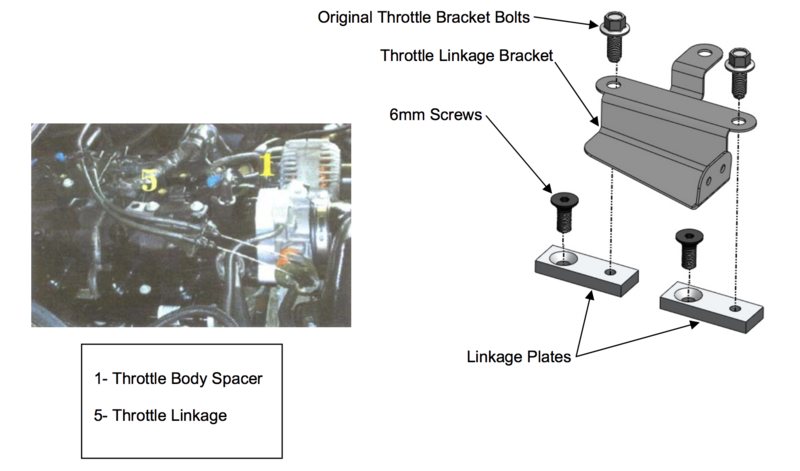 Install linkage plates using two 6mm screws. Install throttle linkage bracket to the plates with the two screws that were set aside from step 4 above. 6. Install vortec spacer on intake. Install gasket. Install throttle body unit. Bolt down with three 6mm x 60mm bolts and washers. Torque to 6ft-lbs. 7. Install throttle linkage and wire connectors. 8. Inspect throttle for open and closed travel. Reinstall air cleaner housing. 9. Start engine and let idle for approximately five minutes. Drive the vehicle for approximately fifteen minutes to allow the computer to relearn.